White and Tabby Timothy is about 7 years old and black and white Jersey is about 10 years old. 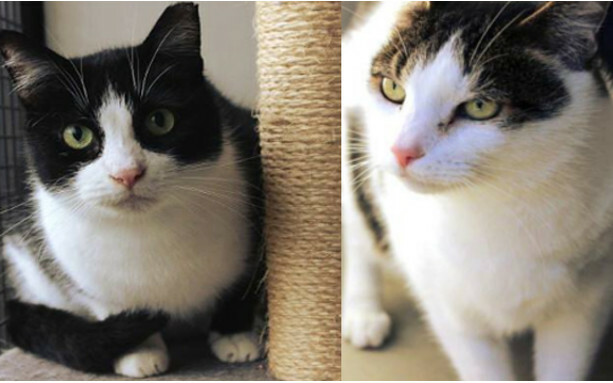 Both came into CPL care from the West Coast with housemates Libby and Tallis (both already adopted) when their owner passed away. Jersey is shy to start with but friendly and affectionate once he knows you. His missing ear-tip indicates that he was desexed as part of a TNR program so he may have been a stray at some time. Timothy is shy at first but friendly and playful once he knows you. He is spending much of his time hiding in his favourite box bed but can be easily coaxed out for treats. Timothy and Jersey are best friends and we would like them to be adopted together. They do not like dogs and will suit a quiet home and a patient new owner. Jersey is on a special diet due to stress-related urinary issues and needs to remain on this. Timothy has had a cyst removed from his shoulder since arriving with us, this has healed well and is not expected to give further trouble.